Do you have a local farmers market you love? One of my favorite things about our new neighborhood is the lovely farmers market in the Spring and Summer. Now that Fiona will tolerate the stroller (it was a long journey to this point…) we all walk up there together and let the kids run free while perusing the farm stands to see what’s in season. Last week was all about berries! I just get giddy seeing the little cartons of blueberries and cute little strawberries with stems intact. 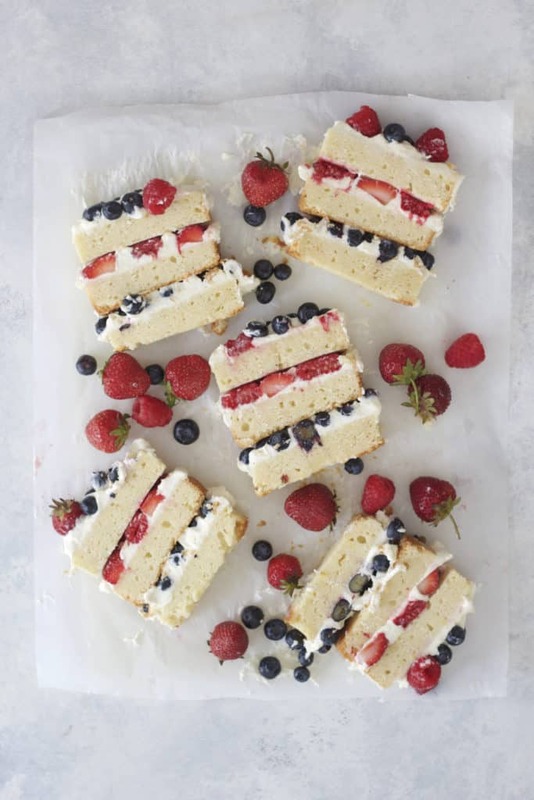 That was my inspiration for this summery treat- something light, fruity, and patriotic for 4th of July this coming weekend. What’s great about this is the option to make it no bake if you’d like. Simply pick up a pound cake and slice it into layers. 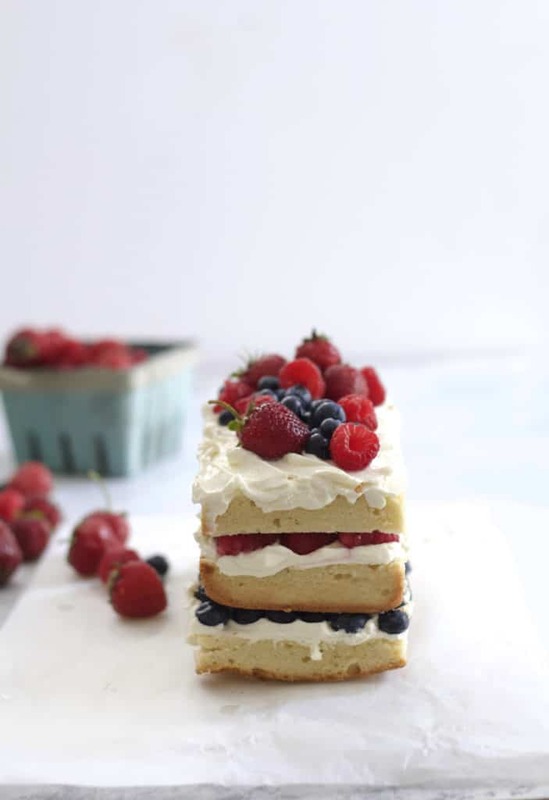 Whip up the filling, layer with berries, and you have a light and delicious dessert a few hours later. If the weather were more like 90s and humid around here, (like it was a couple weeks ago,) I may have chosen to do that, but I love my recipe for Cream Cheese Pound Cake and baking wasn’t out of the question. Either way- this is a pretty simple treat to throw together the night before your weekend plans and serve for your cookout or BBQ. It doesn’t hurt that it’s pretty patriotic looking right!? The cream filling is a mix of cream cheese and whipped cream, with a touch of lemon, making it the perfect tangy compliment to the buttery pound cake. As for fruit? Use berries, peaches, or whatever is in season at your local farm stand. This is summery dessert perfection! 2 cups of sliced berries, thinly sliced peaches, or other seasonal fruit. Cream together the cream cheese, lemon zest, juice, and powdered sugar. Whip the cream to stiff peaks and gently fold into the cream cheese mixture until smooth and fluffy. Set aside. Slice the cake horizontally into 3 layers. Line a loaf pan with parchment paper that overhangs the pan, giving you two tabs to pull up to later remove the cake. Place one layer of pound cake into the bottom of the pan. 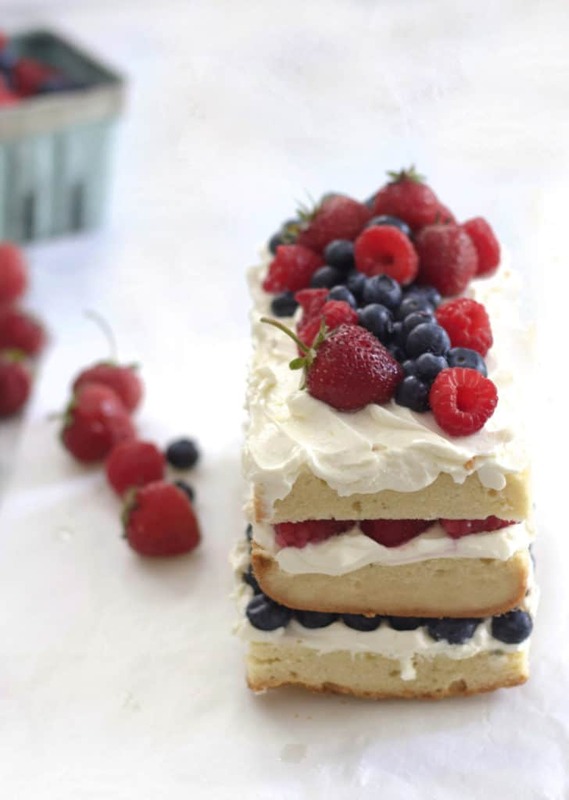 Spread a thin layer of the cream cheese mixture followed by a later of berries and another thin layer of cream cheese. Top with another layer of pound cake and repeat, ending with the top later of pound cake and the remaining cream cheese mixture. Wrap the top and whole pan with plastic wrap and chill in the fridge for 4-6 hours or overnight. When ready to serve, use the parchment to gently lift the cake out of the pan. Serve with more berries if desired. This is totally my ideal dessert!! Such a simple concept but executed so beautifully! All the gorgeous layers are just hard to resist…How wonderful! OH MY GOSH this cake is soooooooo delicious!!! I made my homemade poundcake and used just fresh strawberries. The only thing I changed was I had to add more powdered sugar. My cream mixture just wasn’t sweet enough with the recipe as is. I will for sure make this over and over again.